Online businesses are well aware that distance is a major factor when it comes to the cost of shipping. It’s important to know these shipping costs before you send your products, so you can price your items accordingly and select your best shipping option(s). 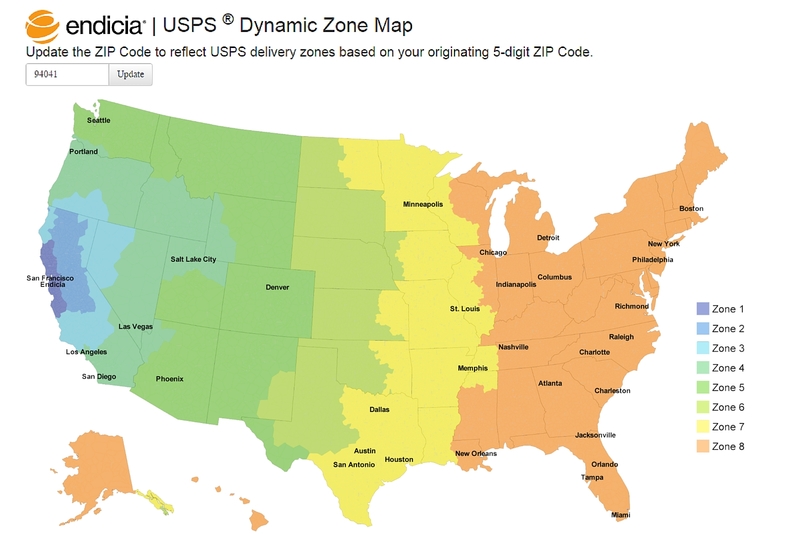 To give you a hand, the Endicia team has developed the Dynamic USPS® Zone Map. This map identifies the USPS delivery zone based on the package’s origin location and final destination in the United States. Once you know the USPS zone, you’ll be able to calculate shipping costs for your package. But before you start using this tool, you should understand how USPS zone pricing works. How Does Distance Affect USPS Shipping Rates? The price of certain mail classes is determined by how far the package or letter travels to get to the receiver. Put simply: the longer the distance, the more you pay in postage. However, the distance is not measured in miles, as some might expect. It is measured in “zones” that are determined by the USPS. Zones range from “Zone 1,” which is closest to you, to “Zone 8,” which is typically the furthest from your starting point. The farther away you ship your package, the more zones it must cross and the higher the delivery cost. However, not every USPS service is affected by distance. Which USPS Shipping Services Are Impacted by Zone Pricing? First-Class Mail, Standard Mail, Library Mail and Media Mail are not zoned, which means that you pay the same price no matter where your mail is going in the United States. On the other hand, USPS Priority Mail, Priority Mail Express, Standard Post and Bound Printed Matter are all zoned. If you need to use these services, the dynamic zone map will help you identify the correct shipping zone. There are some Flat Rate options (boxes and envelopes) for Priority Mail and Priority Mail Express. They are mailed for one set price no matter the destination or weight, just like the slogan, “If it fits, it ships.” All other (non-Flat Rated) Priority Mail and Priority Mail Express prices are based on zone and weight. How Do I Use the Endicia Dynamic Zone Map? To use this tool, all you have to do is type in the origin ZIP code, and the map does the rest. A color-coded map will appear (like the one above) that will show you the USPS zones based on your location. The cooler colors indicate zones located closer to you and the warmer colors represent zones farther away. Now you are armed with the USPS shipping zone information you need to help decide what USPS service will provide the best shipping rate for your online business. For more information on mailing and shipping prices, check out the USPS’s Shipping for Business page. To stay on top of other USPS shipping news and to compare shipping rates, visit our FedEx vs. UPS vs. USPS page.